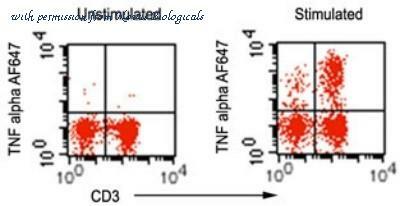 TNF-alpha in Mouse T Cells. 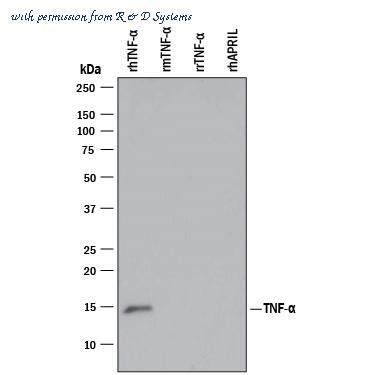 TNF-alpha was detected in immersion fixed activated mouse T Cells using 15 ╡g/mL Mouse TNF-alpha Antigen Affinity-purified Polyclonal Antibody (Catalog # AF-410-NA) for 3 hours at room temperature. Cells were stained (red) and counterstained (green). View our protocol for Fluorescent ICC Staining of Non-adherent Cells . 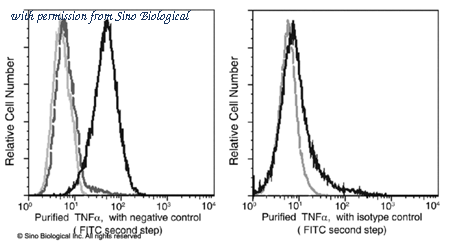 Detection of Recombinant Human TNF-alpha by Western Blot. Western blot shows 25 ng of Recombinant Human TNF-alpha (Catalog # 210-TA ), Recombinant Mouse TNF-alpha aa 80-235 (Catalog # 410-MT ), Recombinant Rat TNF-alpha (Catalog # 510-RT ), and Recombinant Human APRIL/TNFSF13 (Catalog # 5860-AP ). 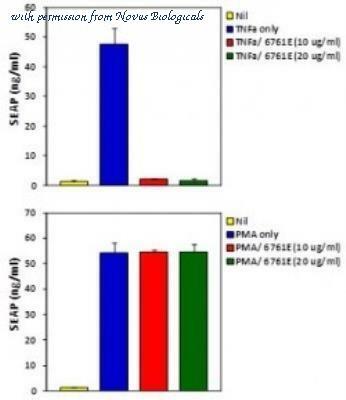 PVDF Membrane was probed with 1 ╡g/mL of Mouse Anti-Human TNF-alpha Monoclonal Antibody (Catalog # MAB610) followed by HRP-conjugated Anti-Mouse IgG Secondary Antibody (Catalog # HAF007 ). A specific band was detected for TNF-alpha at approximately 15 kDa (as indicated). This experiment was conducted under reducing conditions and using Immunoblot Buffer Group 3 . Cytotoxicity Induced by TNF-alpha and Neutralization by Human TNF-alpha Antibody. Recombinant Human TNF-alpha (Catalog # 210-TA ) induces cytotoxicity in the L-929 mouse fibroblast cell line in a dose-dependent manner (orange line). 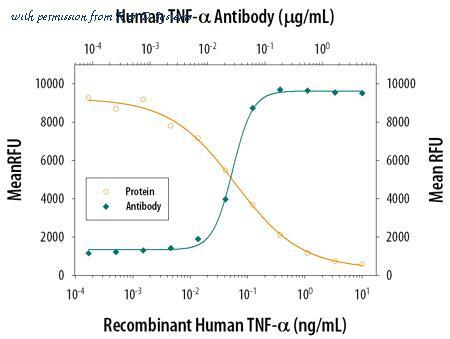 Cytotoxicity elicited by Recombinant Human TNF-alpha (0.75 ng/mL) is neutralized (green line) by increasing concentrations of Goat Anti-Human TNF-alpha Antigen Affinity-purified Polyclonal Antibody (Catalog # AF-210-NA). The ND50 is typically 0.01-0.06 ╡g/mL. The TNF alpha antibody from Proteintech is a mouse monoclonal antibody to a recombinant protein of human TNF alpha. This antibody recognizes human, mouse antigen. 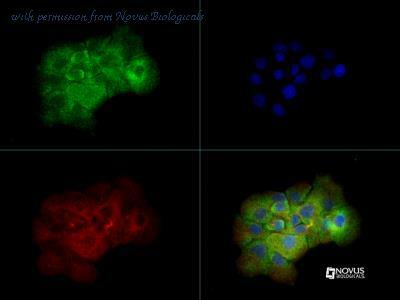 The TNF alpha antibody has been validated for the following applications: ELISA, IHC, WB analysis. The TNF alpha antibody from Proteintech is a rabbit polyclonal antibody to a recombinant protein of human TNF alpha. This antibody recognizes human, mouse antigen. The TNF alpha antibody has been validated for the following applications: WB, ELISA analysis. The TNF alpha antibody from Proteintech is a mouse monoclonal antibody to a recombinant protein of human TNF alpha. This antibody recognizes human,mouse antigen. 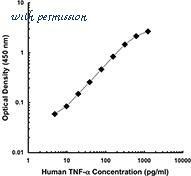 The TNF alpha antibody has been validated for the following applications: IF, ELISA analysis. This antibody is coralite488-conjugated. 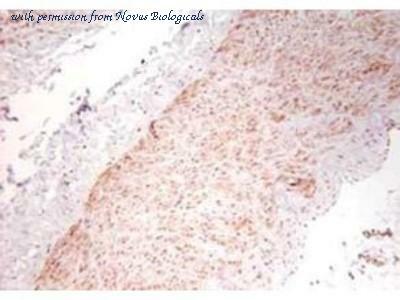 Immunohistochemistry-Paraffin: TNF-alpha Antibody [NBP1-19532] - Staining of TNF alpha in mouse intestine. Immunocytochemistry/Immunofluorescence: TNF-alpha Antibody [NBP1-19532] - TNF alpha antibody was tested in A431 cells with DyLight 488 (green). Nuclei and alpha-tubulin were counterstained with DAPI (blue) and Dylight 550 (red). 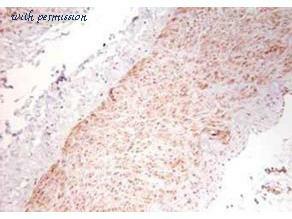 Immunohistochemistry-Paraffin: TNF-alpha Antibody [NB600-587] - Analysis using Azide/BSA FREE version of NB600-587. Staining of human colon diluted 1:100 and incubated with the sample for 2 hours at 20C. 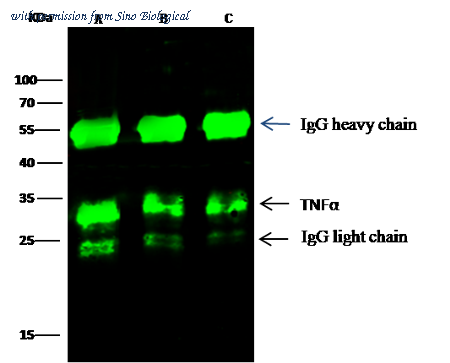 Alexa Fluor(R) 680 goat polyclonal secondary antibody was used diluted 1:5000. Immunohistochemistry: TNF-alpha Antibody [NB600-587] - Staining of formalin/PFA-fixed paraffin-embedded sections of human artery tissue sections. Sections were fixed in formaldehyde and subjected to heat mediated antigen retrieval in citrate buffer (pH 6.0). Slides were blocked for ten minutes with 1.5% serum. Primary antibody was diluted 1:100 and incubated with samples for 24 hours at 4C. 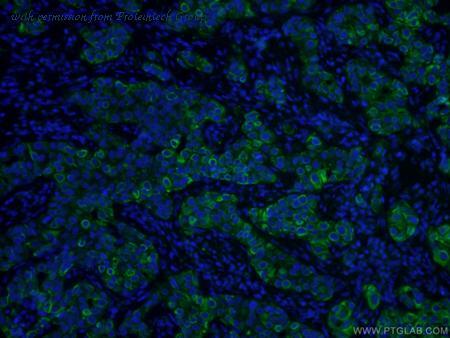 HRP-conjugated goat anti-rabbit antibody was used as the secondary antibody. 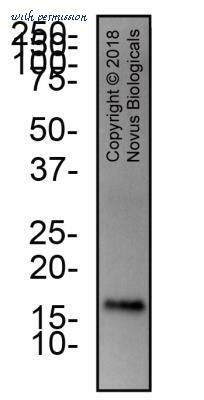 Western Blot: TNF-alpha Antibody [NB600-587] - Analysis using Azide/BSA FREE version of NB600-587. Membrane blocked in 1% BSA-TBS-T 30 min RT, 1:1000 dilution in 1% BSA-TBS-T 4C. Western Blot: TNF-alpha Antibody (6N1E7) [NBP2-27223] - Analysis of TNF- alpha recombinant protein using TNF- alpha antibody at 3 ug/ml. s goat anti-mouse Ig HRP secondary antibody and PicoTect ECL substrate solution were used for this test. Flow Cytometry: TNF-alpha Antibody (6N1E7) [NBP2-27223] - Human PBMC were stimulated with PMA (10 ng/ml) and Ionomycin (500 ng/ml) for 5h in presence of Brefeldin A. 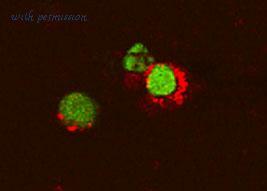 At the end of stimulation, cells were surface stained with before testing with by intracellular staining. Fixed and permeabilized cells were incubated with 10 ul (0.5 ug) of TNF- alpha antibody (or ) for 30 minutes on ice. Lymphocyte population was gated for analysis to show TNF alpha positive T cells. Formalin-fixed and paraffin embedded rat hippocampus labeled with Rabbit Anti-TNF alpha Polyclonal Antibody (ABIN677318) at 1:200 followed by conjugation to the secondary antibody and DAB staining. 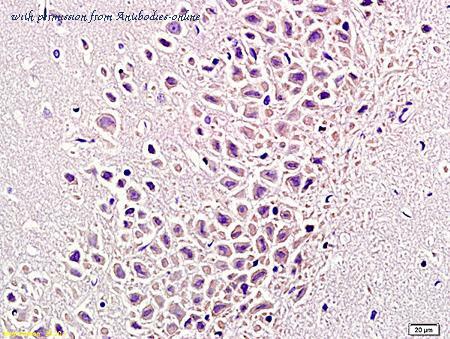 Immunohistochemical analysis of paraffin-embedded rabbit cartilage using TNF-alpha antibody. Flow cytometric analysis of Purified anti-Human TNFa on CHO transfected cells and stimulated lymphocytes. Left panel The transfected cells stained with Purified Mouse anti-TNFa (Bold line hisgram,1 ?g/test), To demonstrate specificity of staining, the binding of 10602-MM01 was blocked by the preincubation of the purified antibody with molar excess of recombinant human TNFa (5 ?g, Cat. No. 10602-HNAE) for 1 hour (dashed line hisgram), then stained with a FITC-conjugated second step antibody. Right panel Human PBMC were stimulated for 4 hrs with Leukocyte Activation Cocktail (with BD GolgiPlug™, BD Pharmingen™ Cat. No. 550583), then cells were harvested and treated according to manufacturer’s manual (BD Pharmingen™ Cat. No. 554714). Flow cytometric analysis of anti-human TNF? on stimulated PBMC. Human peripheral blood mononuclear cells were stimulated for 6 hrs with Leukocyte Activation Cocktail, with BD GolgiPlug™ (BD Pharmingen™ Cat. No.550583). Cells were then fixed and permeabilized according to manufacturer’s manual (BD Pharmingen™ Cat. No. 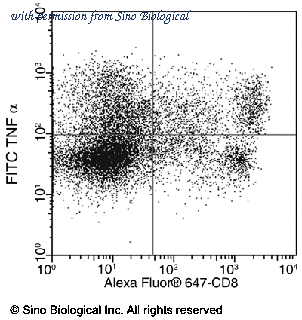 554714), followed by staining with Alexa Fluor® 647 Mouse Anti-Human CD8 (clone RPA-T8, BD Pharmingen™ Cat. No. 557708) and FITC Mouse anti-Human TNF?. The dot plots were derived from gated lymphocytes. 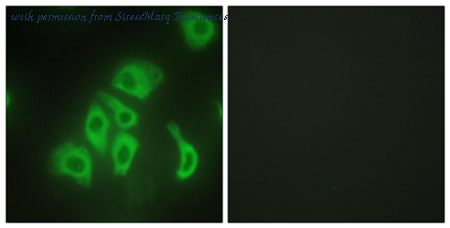 Immunocytochemistry/Immunofluorescence analysis using Rabbit Anti-TNF alpha Polyclonal Antibody (SPC-1315). Tissue: HepG2 cells. Species: Human. Primary Antibody: Rabbit Anti-TNF alpha Polyclonal Antibody (SPC-1315) at 1:100. The image on the right is treated with the synthesized peptide. Immunohistochemistry using Rockland's polyclonal TNFa antibody showing staining of formalin/PFA-fixed paraffin-embedded sections of human artery tissue sections. Sections were fixed in formaldehyde and subjected to heat mediated antigen retrieval in citrate buffer (pH 6.0). Slides were blocked for ten minutes with 1.5% serum. Primary antibody was diluted 1:100 and incubated with samples for 24 hours at 4°C. 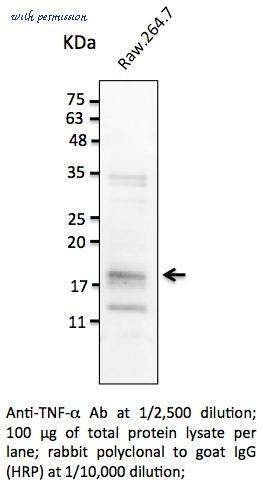 HRP-conjugated goat anti-rabbit antibody was used as the secondary antibody. This product has been discontinued. Please see note.